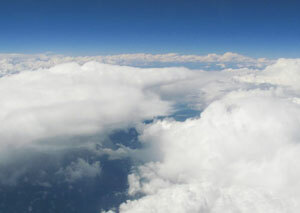 Because of pressurized cabins, altitude sickness rarely occurs during air travel. You are overlooking the most breathtaking scenery in the world and the valley below looks like a tiny, indistinguishable speck. You begin to sway, have a headache, feel light-headed and dizzy and your legs begin to tremble. You think you’re about to toss your cookies and you can’t seem to think straight. Is it a heart attack? Are you dying? Chances are, you are experiencing altitude sickness. The mountain patrol has been called, you’re strapped into the rescue basket and the snowmobile whisks you down to a lower elevation and into the medic’s office for water and oxygen. *Acclimate yourself before you reach your elevation. At sea level your blood oxygen is 98%. At 10,000 feet it is reduced to 89%. With exertion you can easily drop below the level required to stay conscious. So take it easy the first day or two. *Reduced atmospheric pressure at higher elevations can cause your water molecules to virtually leap out of the body through respiration and sweating. Hydrate yourself with at least 6-7 liters (about 6-7 quarts) of water daily. Whether you are thirsty or not, you need it. Respiration, sweating from exertion and the limited amount of oxygen at a high altitude all contribute to the massive loss of moisture in the body. Dehydration happens so quickly in the high altitudes that a body needs phenomenal amounts of water to keep altitude sickness away. Also see: You Lost Your US Passport: Now What? *It’s always a good idea to be in good physical shape before you exert yourself on the mountain with skiing or hiking. Not everyone experiences altitude sickness, but sometimes even a healthy person can feel out of sorts. *If you are flying into a high elevation airport and will not have time to acclimate, ask your physician, before you go, about the prescriptions Diamox or Acetazolamide. Both seem to be the industry standard for the prevention of altitude sickness. Who Succumbs to Altitude Sickness? Even if you live at a higher elevation, it is still no guarantee that you will avoid altitude sickness. According to Better Health Channel, Healthier Living Online, if you’ve had elevation sickness before, you are more likely to experience it again. Young and old, healthy and not so healthy, everyone is susceptible to altitude sickness. 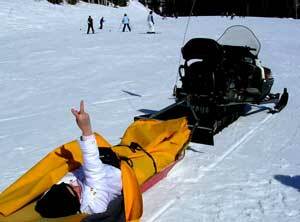 After living several years in the mile-high city of Prescott, Arizona, Kathi did not think she needed to take any precautionary adjustments before arriving at the ski resorts of Utah. Kathia is rescued at a ski resort in Utah. Today she finds little comfort in knowing she kept the mountain patrol employed when she nearly passed out on the slopes from altitude sickness. I now draw your attention to the picture of Kathi being dragged off the hill in a rescue basket. She calls it the dummy basket because she didn’t heed the warnings. A little prevention on your part will go a long way ensuring a fun, healthy and memorable vacation. Kathi Calahan & Kevin Manley are international travel photojournalists who also write about haunted destinations and healthy travel. They are regular contributors of an irreverent motorcycle Astrology column in Arizona called Biker Astrology. Visit their website, godseer.com. Allianz Has An App for That!